A crazy little bass from Brian, but will it rock us? Delightful to play, with its own character and sounds - recommended. Well styled and nicely built. Unexpected variety of solid sounds. Chrome knobs would suit the guitar better. Unlike the obvious Strat/Precision or the SG/EB-3 pairing, the Brian May Bass seems a somewhat curious design choice. However, seeing it in the flesh and, indeed, playing it, proves its worth. "If you want something off the beaten track, the Brian May Bass has a great deal to offer"
A short 800mm (31.5-inch) scale length means it's visually well proportioned, with a set neck construction and a cherry-red, fully bound mahogany body, mahogany neck and ebony fingerboard. It has 20 frets, Hipshot tuners and the bridge is a high-mass, raised-tail design. 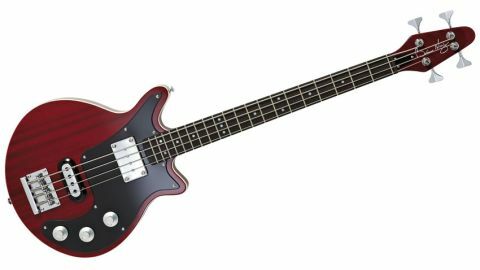 Although the bass is made in Korea to keep the costs trim and is less electronically complicated than the Brian May guitar, it's a very nicely put together instrument. Passive circuitry provides individual volume controls for the huge Gibson-style humbucker and the skirted Burns-like single-coil set, alongside a master tone control. Curiously, the humbucker does not dominate the sound, so it's easy to get a good balance between the two. Rolling back the tone control reveals an almost parametric slant for the very last section and produces a great throatiness to the overall sound that is both unexpected and rather good. Backing off both volume controls a little actually unleashes the best hollow tones, too. Full of sound and visual appeal, the Brian May Bass is a little too pricey for the beginner, but if you want something off the beaten track, this has a great deal to offer.